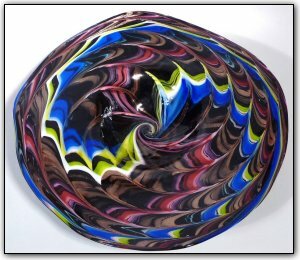 This wallbowl was made from hand pulled canes of deep and rich colors, featuring pink, blue, and lime green over a dark black background with lots of real gold adventurine added for a real gold sparkle. Working with cane is a two stage time consuming process, first Dirwood hand pulled the canes used to make this wallbowl then he made the bowl with those canes. And with the gold adventurine, the more light you shine on it... the more it will sparkle!